Oh by gosh by golly, it's time for mistletoe and holly. And if you live anywhere in the green area of this map, you're in luck because you can go out and find the real stuff. 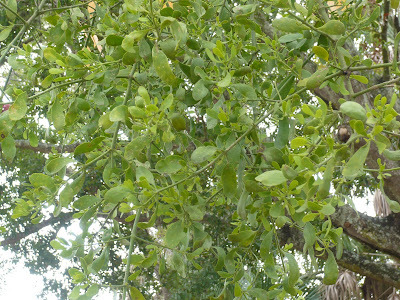 Mistletoe is actually a group of parasitic plants and what's usually seen around Christmas in the US is Phoradendron serotinum. 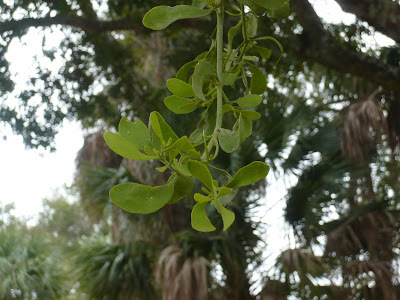 There are a number of other mistletoes that grow in the US and indeed the world, but Phoradendron is the prize winner. Florida's lousy with the stuff, all you have to do is look up into an oak tree and chances are good you'll see it. It's just a matter of identifying it. Every Christmas, I go out and collect fresh mistletoe and hang it over the doorway in my living room. Most people are amazed when they see it and find out what it is. I suppose that's due to the omnipresence of the plastic stuff. Mistletoe dies and withers within hours of my cutting it and I've never been able to figure out why or to prevent it from happening. Oh well. I usually wait until a day or so before Christmas to go collecting for that reason. I've been collecting and hanging fresh mistletoe for so many years that it just wouldn't be Christmas without it. If you find some for yourself, be careful with it. It's seriously poisonous, so don't use it near food. But poison aside, nothing says Christmas to me quite like it. I was just discussing mistletoe with my two young children today. We were looking into the tree branches for the fresh green color. I can't wait to share your information with them tomorrow. 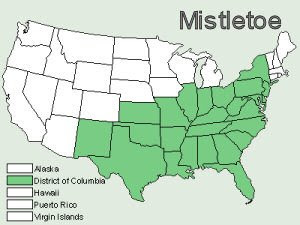 Thanks for the map showing where mistletoe grows. Hah hah! I'm glad to hear I'm not the only mistletoe purist out there. When you're searching, concentrate on the oak trees. Mistletoe seems to prefer them. Good luck!